Geoff Berner doesn’t mince words. An excellent musician, he puts them to melodies that range from mournful to joyous to angry, sometimes all in one song, sometimes all at the same time. There are lyrics that inspire and those that disturb. Every song makes you think, feel, move. Berner will no doubt draw an enthusiastic crowd at the Vancouver Folk Music Festival next weekend. His latest CD, We Are Going to Bremen to be Musicians (2015, Oriente Musik/COAX), was produced by Socalled, aka Josh Dolgin, who also contributes piano and vocals to the recording. The title song is a reinterpretation of the Brothers Grimm fairy tale Town Musicians of Bremen. Raised in Vancouver in the Reform and Conservative traditions, Berner’s lyrics, while mostly English, are steeped in Yiddish culture and his style is most definitely klezmer. “My grandparents spoke Yiddish,” he explained to the JI, “but it was not seen as something worth teaching to their children. So, to a certain extent, I’m trying to reclaim my heritage. We listened to some klezmer music at home and at Hebrew school, and a lot of other stuff, too. Berner has strong opinions, that’s for sure, and his songs can be highly critical, no doubt – just ask Gregor Robertson or Stephen Harper, among many others who have made their way into Berner’s discography. But, while he may be tilting at windmills, Berner is trying to rouse action and, with his music, he is trying to do something himself to change the world. Which is why a description of Berner in the Ottawa Citizen as “eternally cynical” doesn’t quite ring true, nor do other similar categorizations. One of the most fun and, at the same time, discomforting songs on Berner’s latest recording is “Dance and Celebrate,” which doesn’t just talk about celebrating the “misfortunes of people we hate” but wishes misfortunes on people, and lumps together the likes of Joseph Stalin, Margaret Thatcher, Ariel Sharon and Harper. 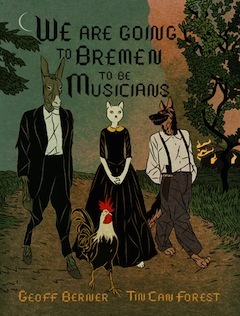 Many people have appreciated We Are Going to Bremen to be Musicians, it seems. In addition to the recording, Berner created a book of the tale, with illustrations by Tin Can Forest. Tin Can Forest Press’ first printing of it, published in 2015, sold out; the second printing will be available next month. Berner has also written a novel, Festival Man (Dundurn Press, 2013) – wherein “[m]averick music manager Campbell Ouiniette makes a final destructive bid for glory at the Calgary Folk Festival” – which was well received, and he has a second novel on the way, called The Fiddler is a Good Woman, expected in late 2017. He’s right – as serious as Bremen is, it’s uplifting. There is much humor, as song titles such as “I Don’t Feel so Mad at God When I See You in Your Summer Dress,” readily attest, and much with which Vancouverites in particular will relate – take the song “Condos,” for example. And where else will you hear David Bowie’s “Always Crashing in the Same Car” in Yiddish? Berner is one of more than 60 performers scheduled to perform at the Vancouver Folk Music Festival this year. The festival, which takes place at Jericho Beach July 15-17, also includes Israel’s Yemen Blues with Ravid Kahalani. For a 2011 interview with Kahalani, click here. For the full lineup and tickets of the folk festival, visit thefestival.bc.ca.